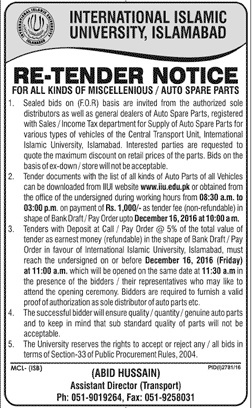 Pakistani news papers Government and Private Tender Notices for today 12-2-2016 Friday, below you can find all latest tender details. Oil and Gas Development Company Limited Invites sealed bids for the construction work only for registered firms with PEC. HAZARA University MANSEHRA PAKISTAN Notice Inviting Tender. Federal Government Ploy Clinic (PGMI) Re-Tender Notice. Saibaan Development Organization is a non-Governmental, non-profit, national humanitarian Organization. 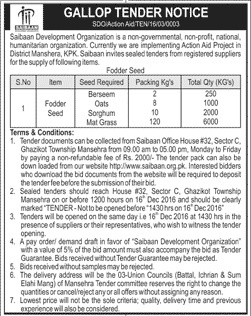 Manshera, KPK invites registered suppliers for GALLOP Tender notice. 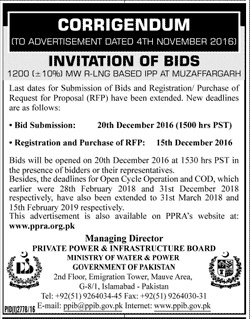 Ministry of Water & Power Government of Pakistan Islamabad Invitation for Bids. 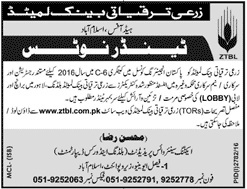 Zarai Taraqiati Bank Ltd. Tender Notice. International Islamic University Islamabad Re-Tender Notice. 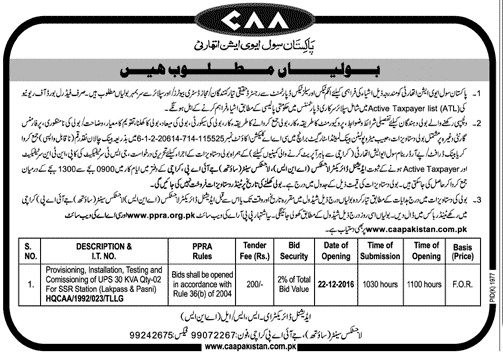 Pakistan Civil Aviation Authority Notice for Provisioning, Installation, Testing and commissioning of UPS. Pakistan Petroleum Limited. Tender Notice. SUI Northern Gas Pipelines Limited Tender for Annual Transportation Contracts. 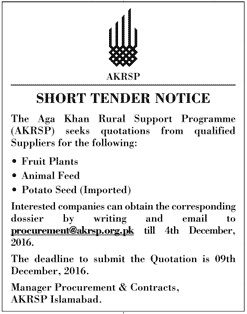 Aga Khan Rural Support Programme (AKRSP) seeks quotations for qualified suppliers for Food Plants, Animal Feed, Potato Seed (Imported). 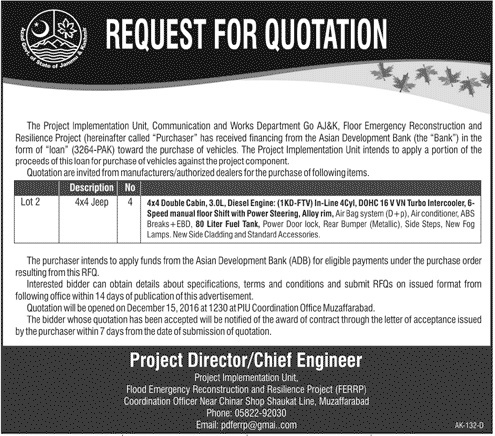 Flood Emergency Reconstruction and Resilience Project Request for Quotation for 4x4 Jeep.